Oregon Health and Science University aims to raise over $500 million by 2015 to construct two new buildings. The $500 million will count toward a $1 billion cancer research fundraising plan at OHSU. The Construction of Collaborative Life Science Building is on time and within budget. This building is providing educational and research space for Oregon Health and Science University as well as Oregon University System. The consortium in the new building allows a sharing of research resources as well as providing a collaborative learning environment for students. The new facility will include lecture halls, classrooms, laboratories, specialty research centers, office space, and the relocation of the Oregon Health and Science University School of Dentistry. The entire cost of the facility is expected to be $295 million with $205 million funded by Oregon Health and Science University, and $90 million from the state of Oregon. The Collaborative Life Science Building will complete by June 2014. Oregon Health and Science University has recently announced to undertake a construction of a new ambulatory care facility, which will create capacity for high-tech ambulatory diagnostic and treatment capabilities. The building is expected to cost $300 million with $240 million funded by debt and $60 million from gifts. This new ambulatory care facility is expected to complete in January 2016. Six months ago Phil Knight, a co-founder of athletic shoe giant, Nike and is now a prominent fundraiser of Oregon Health and Science University Knight Cancer Institute, announced that he would give the OHSU Knight Cancer Institute $500 million, if within two years, OHSU can raise a half billion dollars on its own. It was an all-or-nothing fundraiser challenge for OHSU. With an approval of $200 million in state bond funding for the construction of the Collaborative Life Science Building at OHSU last month, Oregon Health and Science University is contingent on reaching the $500 million mark to match up with Knight’s promise. With the potential $1 billion research funding in place, Oregon Health and Science University is on a course to becoming one of the nation’s top cancer research institutions. In addition to construct two new buildings, Oregon Health and Science University Knight Cancer Institution will spend the rest of Knight’s grant on hiring 20 to 30 top researchers and allowing them to take risks in cancer research. Freeing up those top-level cancer researchers from the pressure of grant writing promises them to fully focus on research, and OHSU Knight Cancer Institution will attract a dream team of researchers from prestigious medical centers. Those cancer researchers will arrive at OHSU Knight Cancer Institution with their teammates and cutting edge research projects. The Knight’s grant also adds to Oregon Health and Science University more attractiveness for laboratory supply companies who want to market to academic researchers and laboratory managers in the Oregon marketplace. 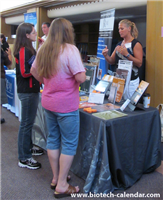 The Annual BioResearch Product Faire™ Events provide access for lab supply companies to network with researchers at Oregon Health and Science University. 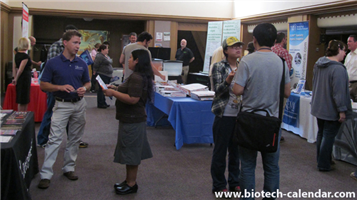 On September 11, 2014, Biotechnology Calendar, Inc. invites laboratory supply companies to demonstrate their lab products and services to OHSU researchers at the OHSU BioResearch Product Faire™ Event. Last year about 150 research professionals attended the OHSU BioResearch Product Faire™ Event. Of these attendees, 27% were professors and post docs and the rest were active hands in research. There are more BioResearch Product Faire™ Events at different institutions across the nation, please read: National Show Schedule For 2014.